Contrary To Popular Belief, Acne Bacteria Do Not Cause Acne. Discover Why Acne Is Not A Problem With Your Skin! Acne bacteria or Propionibacterium acnes are only small part of the acne formation process. Killing the Acne Bacteria may help reduce the inflammation of an already grown pimple but it will NOT stop the the internal problem that's causing acne in the first place. Acne is usually described by the medical establishment as an inflammatory skin disease. The inflammatory response is influenced by many on-the-surface factors such as the overproduction of sebum (oil) and keratin by the sebaceous glands. This overproduction of oil clogs the hair follicle and leads to bacterial growth. The bacteria multiplies and causes inflammation, and the result can appear in the form of what is known as a blackhead (an open comedo) or a whitehead (if it's below the surface). The truth is, acne is more than skin deep. Beyond inflammation triggers, beyond your skin type (oily, dry, rigid), beyond the overproduction of sebum, beyond blocked pores and beyond the acne bacteria itself, there are hidden factors that play a major role in the formation of an acne environment. Yes, you heard me right. Acne is everything but a disease. Acne like most western afflictions is not a disease per se. Listen carefully: acne is a RESULT of a dis-ease. 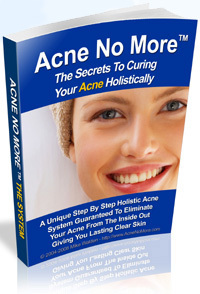 Acne is a symptom of a disease or the body's way to manifest a state of imbalance. Acne is the end result of endless messages your body sends you, which you stubbornly choose to ignore. Why am I telling you this? Because if you continue to be misguided by the medical establishment thinking acne is a skin disease, you will continue to treat it as nothing but a problem with your skin, when in fact the problem lies way beneath. You must understand that if you have acne, you have a dis-ease but it's not your skin that is inflicted, it's your delicate inner natural balance that has been destroyed. Acne and your skin are only the reflections of a much deeper affliction that you MUST address if you ever want to get rid of your acne and if you ever wish to regain your health. As for the question "why do most doctors insist on treating acne as a skin disorder? ", you guessed it! It pays more. If the problem is not with your skin how on earth would they be able to sell you all these worthless lotions and antibiotics? Propionibacterium acnes, or p acne bacteria, the bacteria we all have on our skin is a life form. Like all life forms it fights to survive and sustain our lives. Yes. These 'vicious' tiny creatures, western medicine so eagerly wishes to destroy, play a vital part and perform a very important function. Acne bacteria exists in everyone, whether they have acne or not. As long as the acne bacteria is in balance with your body it will prevent colonization by more harmful bacteria. This bacterium is also essential for keeping your skin flexible. The acne bacteria feeds itself from the secretions of our sweat and sebaceous glands. And this is a normal biological state, that ccurs on the skin of every individual whether he has acne or not. You must understand that the acne bacteria is not contagious and does NOT cause acne. If it did than why doesn't everyone have acne? we all have bacteria right? so why only SOME of us have acne while others don't? Did you know that streptococcus bacteria exists in everyone's throat, but not everyone has a strep throat or tonsillitis. Why? because similar to the acne bacteria these bacteria will not flourish and will not result in acne or strep throat UNLESS the right condition or the SPECIFIC ENVIORNEMENT will be created. Acne is a condition, an environment that exists only when the production of sebum oil on the skin is excessive (triggered mainly by hormonal imbalance) and when this sebum oil is mixed with congested toxins (usually blood toxins that are expelled through your skin). When blood toxins are mixed with this over production of oil, the bacteria flourishes and starts multiplying like mad. This condition results in the old known hateful symptoms of acne: swelling, inflammation and pus. The ONLY way to stop acne permanently is to prevent this condition from happening. (bacteria multiplying on blood toxins and excessive production of oil). You can NOT stop acne by killing the bacteria. Killing the bacteria, wins ONLY the short run simply because the bacteria will continue to multiply as long as we don't stop what's casing it to grow. That is why antibiotics like monocycline or tetracycline or benzoyl peroxide will NEVER work long-term. WHY? because they kill the acne bacteria INSTEAD of neutralizing the condition that makes the acne bacteria multiply. So what's the REAL cause of acne then? So now we know what causes acne bacteria to multiply and what mixture or environment causes acne. BUT this is only on the skin surface. In order to completely and permanently cure and prevent acne we must know what causes these blood toxins and hormonal imbalance that create this triangle of oil-toxins-bacteria in the first place. Listen carefully: The acne triangle condition created on the skin surface is triggered by many factors: hormonal, nutritional, environmental and/or psychological changes in the body. The secret for permanent clear skin is therefore, neutralizing ALL the above factors that create the environment where the bacteria multiplies while keeping the amount of bacteria on our skin at an optimal balance.